AMU Financial Aid department was designed for student’s interest in financial aid. It is dedicated to help each student and family to create a strategy that works for them. Our Financial Aid professionals will make every effort to help students to satisfy all deadlines and eligibility requirements and meet the full demonstrated financial need. 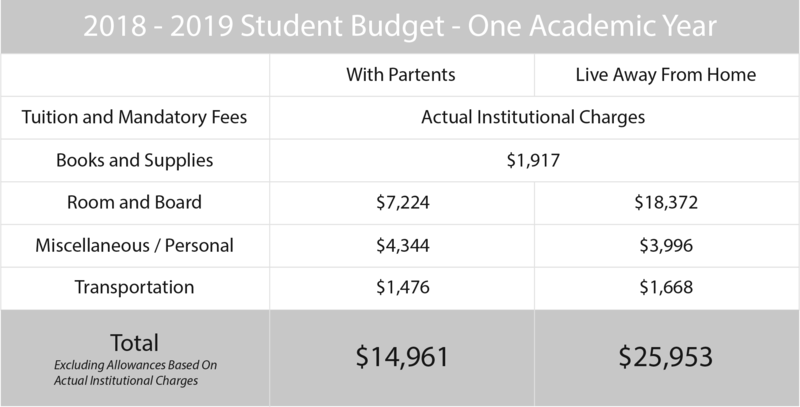 The standard budget listed below is the estimated four – quarter cost for a full time AMU student in Acupuncture and Oriental Medicine program. All Fees are subject to change. For student who enroll in Clinic Intership, $50 malpractice insurance per quarter will be adjusted to the budget shown on this table. 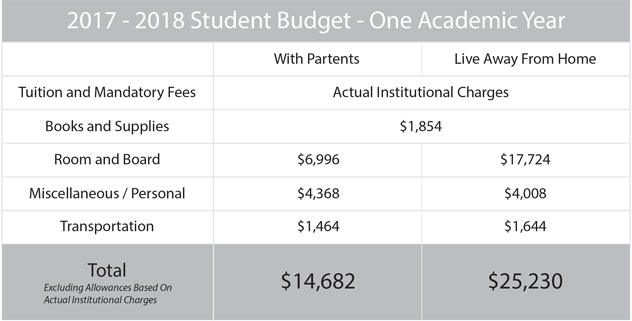 The expense budgets shown on this table are based upon California Student Aid Commission. The Federal PELL Grant is a need based grant that does not have to be repaid. It is available to students who exhibit financial need. Financial need is determined by the information you submit on your FAFSA (Free Application for Federal Student Aid) such as income and asset information, the number of people in your family, the number of people in college, etc. Check with the Financial Aid Office or one of the Federal financial aid websites to find out what the current year award amount is. The Federal Direct Subsidized Stafford loan is a low interest rate loan, awarded on the basis of financial need. As a result, no interest is charged as long as the student is attending school on at least a half-time basis, and during their six month grace period after they stop attending at least halftime, withdraw, or graduate. The loan goes into repayment six (6) months after the student has stopped attending at least half-time, withdraws or graduates. The amount of your Federal Direct Subsidized Stafford loan is based on your year of study in college. Check with the Financial Aid Office or one of the Federal financial aid websites to find out what the amount is you may be eligible to receive. The financial aid year is from July 1 to June 30 of the next year, so your loan will have a fixed lifetime interest rate based on the above information depending on when the loan is disbursed (paid to the school or student). Federal Direct Subsidized Stafford loans are only available to undergraduate students. The Federal Direct Unsubsidized Stafford loan is a low interest rate loan, awarded regardless of need. In other words regardless of income if all other eligibility requirements are met, the student is eligible. As a result, interest is charged from the time the loan is disbursed (paid to the school or student) until it is paid in full. This includes the time the student is attending school, as well as during the six month grace period after they stop attending at least half-time, withdraw, or graduate; for the life of the loan. Students have the option of paying the interest while they are attending school and during the six month grace period, or allow it to be added to the principle loan amount (this is called capitalization). Here at we highly encourage our students to pay their accruing interest so they do not end up paying interest on top of interest, which is what happens when the loan is capitalized. The loan goes into repayment six (6) months after the student has stopped attending at least half-time, withdraws or graduates. The Federal Direct Unsubsidized Stafford loan is available to undergraduate and graduate students. Federal Pell Grant and Federal Direct Stafford Loan programs. Student Information Report) selected for verification must be dealt with immediately. No aid can be disbursed until verification has been completed. In order for the selected student to receive their funding, verification must be completed within thirty (30) days from the receipt of the ISIR. This date will be enforced at the discretion of the University. If the student or FAO did not use the DRT (Data Retrieval Tool) when completing the FAFSA (Free Application for Federal Student Aid), a tax transcript must be requested to accompany the Verification Worksheet. The student must complete the “Request for Status Information Letter” and return it to the FAO, or the student may contact the Selective Service directly at the number printed on the ISIR. in the system may be released. If the FAO is unable to establish whether or not a violation has taken place, the student may contact the Selective Service directly at the number printed on the ISIR and also mail the Request for Status Information Letter to Selective Service. A response will either be mailed to the student of the school. In most cases the letter will state it is up to the school to make the decision as to whether the student will be eligible to receive Title IV funds or not. All information from the student must be reviewed to make sure the student was actually unable, not unwilling to register for Selective Service. If it is determined that student was actually unable (which is usually the case with students who are or eligible non-citizens at the time they should have registered, but are not U.S. citizens and because of their age, can no longer register, or because of hospitalization, incarceration, or institutionalization) to register at the required time, aid should be granted. If it is determined the student was seemingly unwilling to register, aid should not be granted. The refusal to grant aid based on the student’s seemingly unwillingness to register must be documented with evidence and the reason given by the FAO and or the institution. Your financial aid eligibility is determined by federal and state regulations and university policy. The amount of your financial aid is determinded by subtracting the family contribution from the estimated cost of attendance at AMU. You may qualify for both Pell Grant and Federal Direct Loans. Students must complete the Free Application for Federal Student Aid (FAFSA) in order to determine their eligibility for Federal financial aid. For more information on applying for Federal student aid. go to http://www.fafsa.ed.gov/. Not participate in the sale or possession of drugs while receiving federal student aid. STEP1.You must take to determine your financial aid eligibility is to complete the FAFSA (Free Application for Federal Student Aid). You have a choice to either do this online or you may bring in your income and asset information as required (usually your Federal income tax return) and work with one of our Financial Aid Officers who will be glad to assist you. STEP2.Once eligibility has been determined, the Financial Aid Officer will design the financial aid package that is best for the student with the grants and/or loans they qualify for. The 2017- 2018 financial aid application year begins January 1, 2017 and ends June 30, 2018. Now is the time to submit the 2017-2018 Free Application for Federal Student Aid (FAFSA). Student who interest to apply federal aid may choose one of the below methods to file a Free Application for Federal Student Aid (FAFSA). Disbursement is the process used to make funds available to student who applied financial aid. Federal Financial aid check is disbursed in each equal payment per academic year. Student will be noticed by email for either pick up or mail to the mailing address provided on file. Dropping units or stop attending or withdraw from your classes can affect your aid eligibility. Student’s Satisfactory Academic Progress will be reviewed before disbursement. For more information about SAP see this catalog. Disbursements are made by the third week of each quarter after add and drop period.